Only one more week till the premiere of our new TV series, JONAS! We can’t wait for you guys to see it and we are even more excited about your SERIES LAUNCH PARTIES! If you haven’t already, be sure to check out http://home.disney.go.com/tv/jonas for your series launch party kit, fun games, and more info about our show! We appreciate you guys so much and want to thank you for EVERYTHING you do for us. In fact, we want to do something for you….check out http://radio.disney.go.com/music/index.html for a chance to win a trip for four to attend our final LIVE dress rehearsal for our WORLD TOUR 2009! 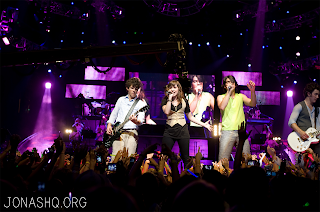 And don’t forget to download your own Radio Disney/OH MY JONAS picture off FFE!! Thanks for helping us live our dream! Making an early alert to retailers, Disney has set a late-June bow for the Jonas Brothers big-screen musical epic ‘The 3-D Concert Experience’ to Blu-ray in late-June. Following a brief theatrical run earlier this year and a box office take north of $30 million, ‘Jonas Brothers: The 3-D Concert Experience’ will hit Blu-ray on June 30, day-and-date with the DVD. Tech specs will mirror those on Disney’s earlier 3-D Blu-ray release of ‘Hannah Montana And Miley Cyrus: Best Of Both Worlds Concert Tour,’ and provide 2-D and 3-D viewing options of the film on a BD-50 dual-layer disc in 1080p/AVC MPEG-4 video and DTS-HD Lossless Master Audio 5.1 Surround. There’s no word yet on bonus features, aside from a second standard DVD disc with a Digital Copy of the film. We’ll keep you posted. You’ll find the latest specs for ‘Jonas Brothers: The 3-D Concert Experience’ linked from our Blu-ray Release Schedule, where it’s indexed under June 30. Toys R Us is having a tote bag of the Jonas Brothers for $10! 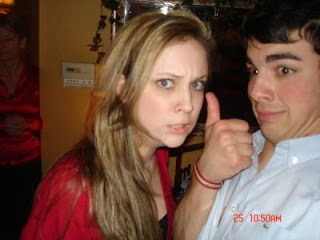 She was the inspiration for the Jonas Brothers’ breakout single, Mandy — as well as Joe Jonas’ main squeeze. Now Mandy Van Duyne has got a role in the short horror flick Consumption, she’ll talk about it all on WZAP Radio tonight at 8:00.